You’ve likely seen many grainy black-and-white ultrasound photos, ones where the baby is almost impossible to see with any amount of clarity. Thankfully, these images are very helpful to those who have a trained eye. But for those of us who haven’t been schooled in reading these 2D ultrasound images, there is another type of ultrasound which looks far more detailed. In the future 3D and 4D ultrasounds may become a standard part of routine prenatal care, but right now 2D ultrasounds are still the norm. There are some conditions which can be more easily detected by 3D and 4D, such as a cleft lip and malformations connected to Down Syndrome. Real time 3D ultrasound is also sometimes used to help in regional anesthesia procedures, as the technology can help identify muscles, nerves, and blood vessels, which enables needles or catheter to be placed more accurately. If you’d like to have a 3D or 4D ultrasound done during your pregnancy, it is a great way to see and interact with your little one before he or she is born. 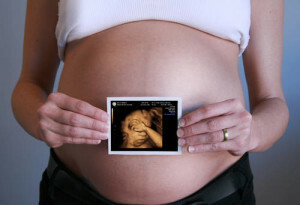 The best time to get this type of ultrasound is between 24-32 weeks, since this is when your baby will be the best size and in the right position for you to get a good look at him or her. Being able to see your little one is a great way to bond, and it can help you feel even more excited about meeting your baby face to face. Furthermore, if you don’t want to wait until the standard 20-week ultrasound to learn your baby’s gender a 3D ultrasound can give you the answer a few weeks earlier. Some 3D technicians will try to tell gender at 15 weeks or earlier, but the accuracy at this stage is low, at about 50%. Waiting for another couple of weeks will help ensure that the gender you’re told is correct. Since extra ultrasounds aren’t always recommended, however, you should speak to your physician and get his approval before scheduling the ultrasound. You should also be aware of the fact that extra ultrasounds are rarely covered by medical insurance, so plan to pay for it yourself.